The new windows go up first; tacked in place and not even caulked. 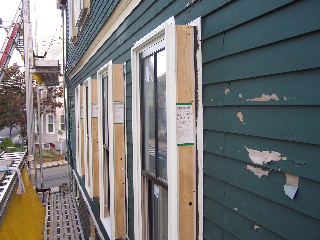 The 2 by 2 framing will secure all the windows at the flanges later the same day and the closed-cell spray foam provided the air and water seal at each window. Image Credit: Cador Price-Jones The non-structural two-by-two wall framing well underway on the Cador residence. Image Credit: Steve Baczek Four 1-inch stacked XPS foam spacers hold the two-by-twos off the existing wall to the required depth for spray foam and the drainage/vent space. Image Credit: Steve Baczek All doors and windows have jamb extensions equaling the depth of the new exterior walls. Image Credit: Steve Baczek The new high performance windows line up directly with the existing; the existing windows stay in place. 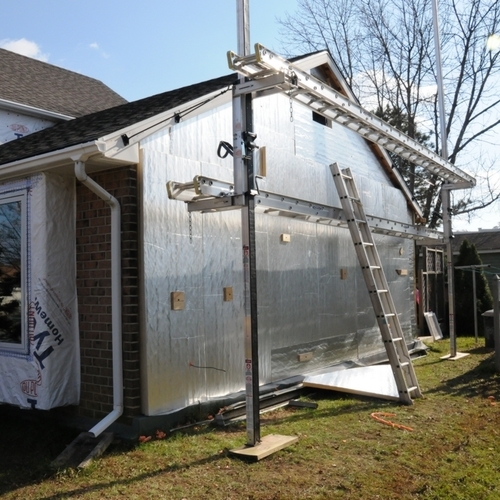 Image Credit: Steve Baczek With everything wrapped that is NOT getting spray foam, the installer starts the installation of the 4+ inches of high density, closed cell spray foam insulation. Image Credit: Steve Baczek The finished wall: new windows, new siding, new trim, new high performance value! 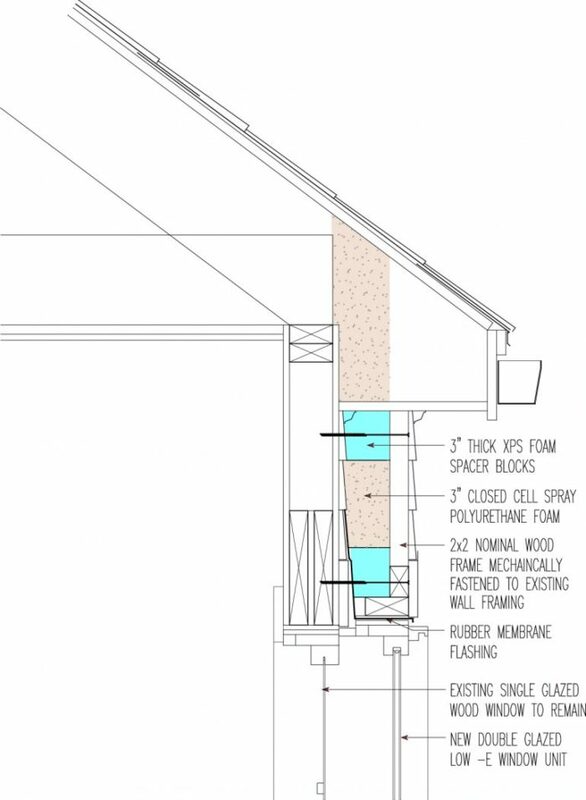 Image Credit: Steve Baczek Bottom-of-wall soffit detail showing space for venting and free drainage. Image Credit: Steve Baczek The interior of the home is virtually unchanged after this deep energy retrofit. The homeowners are keeping the old single-pane sashes in place because they like the way they look and it's just one more layer of insulation. Image Credit: Cador Price-Jones Making the basement high performance meant spray foam insulation on the interior of the existing foundation wall. Image Credit: Steve Baczek Note the transition from interior below-grade to exterior above-grade continuous air sealing and insulation--nice healthy overlap. Image Credit: Steve Baczek Spray foam insulation goes all the way up the eave for a healthy overlap with attic insulation. There are 120 million homes in America, and we need to figure out how to retrofit them for the new reality that we live in. We cannot all choose to move to the country and build a net-zero home and let someone else deal with the existing houses. To get down to 350 ppm of carbon dioxide in the atmosphere and avoid catastrophic climate change, the building sector is going to need to reduce its energy contributions which are estimated at something like 40% of all emissions. As a goal, scientists and politicians like to use the figure of 80% reduction in greenhouse gases by 2050, and the work on my house fits into that target. We need to get away from talk about payback or return on investment and set goals (energy budgets) for our energy use and make plans to achieve them. Ed Mazria’s Architecture 2030, the Thousand Home Challenge, and Passive House help with the goal-setting. Architects like Steve Baczek and HERS modelers like Mike Duclos help with the planning. 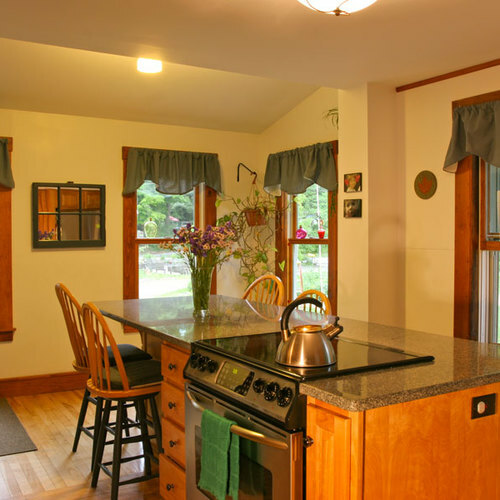 Remodelers like Byggmeister can make the plans a reality. 1. Stacked scrap foam: instead of metal brackets, we stacked rigid insulation scraps to hold the screwed 2 by 2s the proper distance off the old siding. 2. 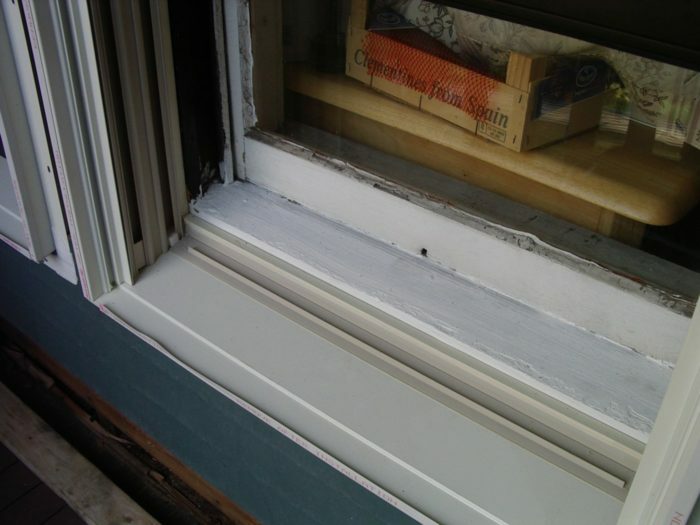 Wall thickness set by depth of new windows: the new windows lined up exactly with the existing ones, we just tacked them in place and the spray foam locked them in. I really liked the appearance of the old sashes, so they stayed. 3. Soffit detail at bottom of wall: Steve’s detail provided drainage, air flow for the new back-vented siding, and a clean look where the new exterior wall system terminates at the first floor level. 1. 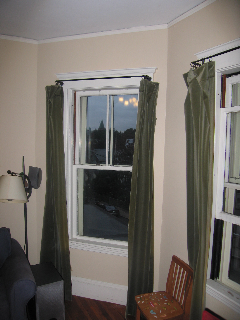 Third-story bay window: Complex little areas up very high are so time-consuming. The bay on the front gable looks great inside and out, but it was inordinately expensive to achieve. 2. The shed dormers: On the east and west sidewalls of the south dormer where I kept the slate, I stopped the foam about 2" off the roofline. The alternative was to cut 5" off the slates and install new step flashing, which would have ended up with me re-slating practically the entire thing. 3. Slate roofs and PV systems: We kept the 95-year-old original slate roof because it is beautiful and in great shape. But I ended up having to strip the slate roof on both the slopes where the PV would be installed. I really tried to get an installer to install posts and boot flashings and patch the slate, but none would do it and I think they were right not to. Each row of panels would require six penetrations, so the whole system would need 42 patches plus the slates that broke by accident. And on top of that, the city required me to bring the rafters up to code, so I had to sister all the rafters with 2x10s. I got more depth for insulation in the process, but it meant taking out the plaster slope in the master bedroom. Overall, slate is great if you don't have to work on top of it. It's a lot of work and a significant barrier to putting rooftop solar systems on old houses. One final eye-opener of the environmental type: at the NESEA 2010 Building Energy conference researcher Daniel Bergey of Building Science Corporation presented some sobering metrics on the relative global warming potential of the major types of insulation -- cellulose, fiberglass, EPS, XPS, high density spray foam (HDSF) and polyisocyanurate rigid insulation (PIR). Given how poorly HDSF compares to PIR, if I were to do my house again I would strip all the siding and use rigid polyiso foam. I believe I am getting great performance with the spray foam, but we can't lose sight of why we are doing these deep energy retrofits in the first place. 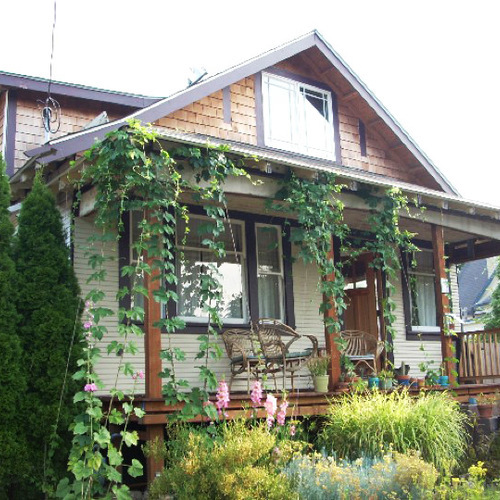 The home is a duplex (upstairs/downstairs). The deep energy retrofit involved strictly energy upgrades (interior of walls in basement, exterior of walls above-grade, and ceiling plane of attic). 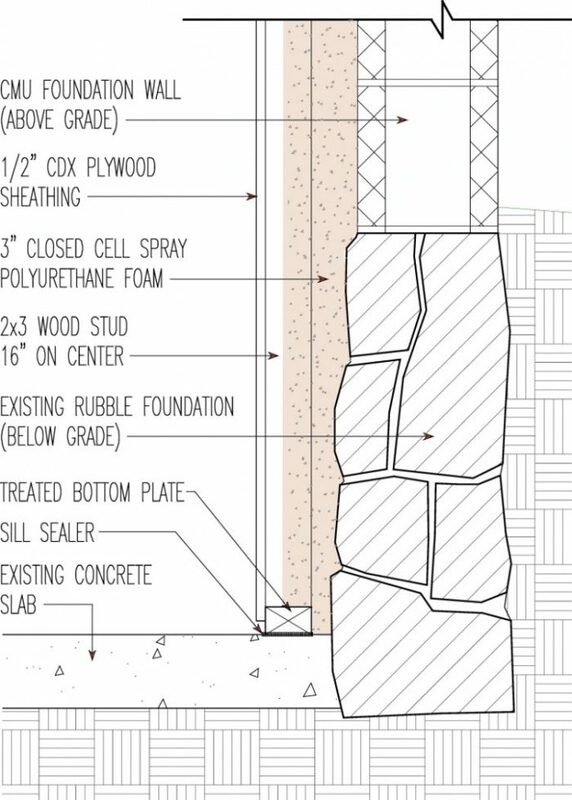 Foundation: 8” concrete block with 3” of closed-cell spray foam (R-18) on the inside and framed stud wall with mold-resistant drywall. 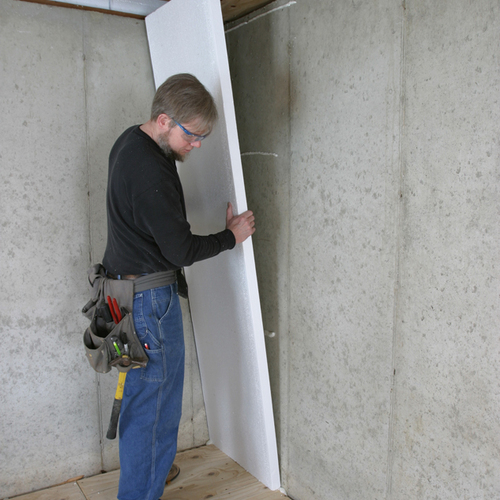 Walls: Existing walls are dense-packed with cellulose (R-13), 4” of closed-cell spray foam (R-24) on exterior. I hope you don't plan to live there for more than twenty years. The "treated" sill and totally encapsulated siding will rot by then. Any gaps in your closed cell foam and/or movement in the encapsulated siding will lead to tiny gaps, moisture infiltration, and failure. Good luck! Would certainly like to hear more about just why you believe this system will fail in the way you describe. Do you think the bond between the foam and existing cladding is prone to gaps; where will the moisture infiltration come from? Do you have experience with this same system of retrofit and resulting problems/failure? What happens at the soffit and overhangs? Is that a total rebuild also? Are you depending on the wall anchors to support the studs, sheathing and siding, or the closed cell foam as an adhesive? Or both? Interesting! In response to "encapsulation": Given the client's investment, I do think their plans are to be there for longer than twenty years, which is good in the fact that I will have access to the system to prove you wrong. The new exterior siding is furred off the cell foam; in other words an airspace is present directly behind the new siding. This airspace (based on simple rainscreen principles) should take the majority of the low volume of water to breach the cladding. This water should simply fall to gravity or dry up given the airspace. There are proper flashings along the vertical path terminating with an effective weep system along the bottom of the wall. 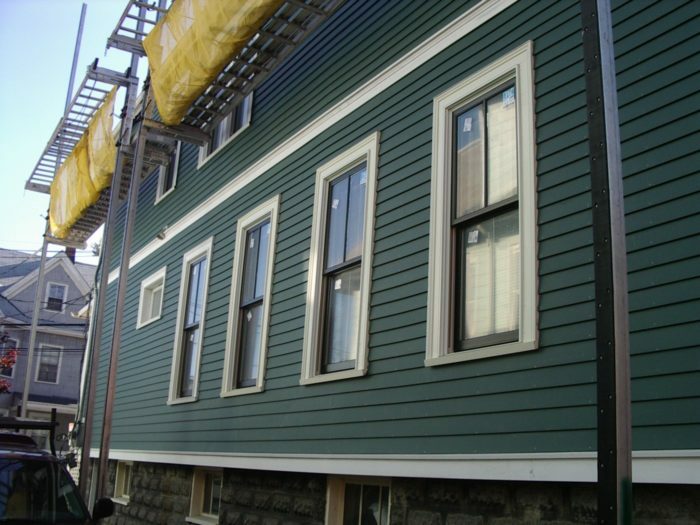 The potential for moisture (in liquid form) to actually make it to the face of the original siding is very minimal. 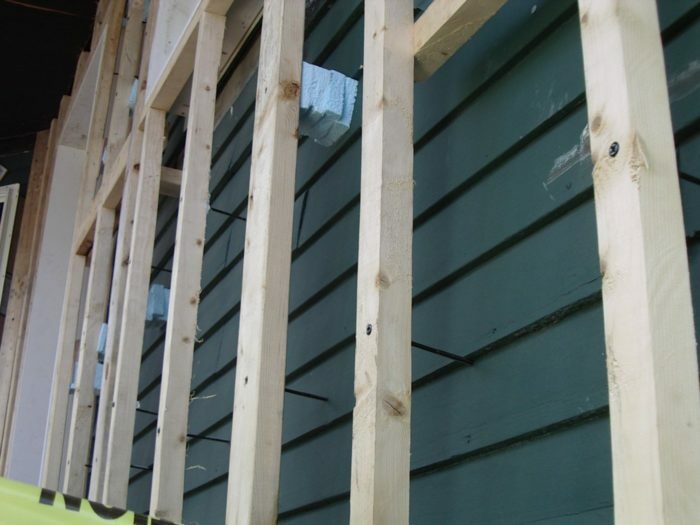 The gaps you speak of would be less than the holes of the nails holding siding on a conventional 2x wood-framed wall system. According to your logic, pretty much all conventionally framed wall systems will leak, take on water and be doomed to the short life of twenty years. Contrary to opinion I firmly believe this wall system to outlast us. Given the fact that the existing wall we covered with foam is air leaky and vapor open (no vapor barrier) to the inside, coupled with the vented/ drainable rainscreen, the wall has a very high potential for drying. A very good building science friend of mine always states "It's OK if things get wet, as long as they have ability to dry." So in summary, should things get wet (and very minimally if it happens) there is a very high potential to dry the wall out. As for luck, I prefer sound building principles. In reference to "attachment and trim," we were very fortunate that deep overhangs already existed so that furring out the wall 4 inches was easily accommodated. Some rebuilding of soffits was needed, but is was small portions on a need basis. Yes, I am depending on the screws to support the stud work and exterior lap siding. We had to do "pullout" calculations to satisfy the building inspector. The foam is intended to merely be a suspended thermal curtain installed in a continuous fashion. Please report back on the change in fuel usage per heating degree day attributed to this upgrade. There's nothing like real heating dollars saved to drive home the point behind this effort. I also appreciate the candid assessment of the global warming potential of insulation used. This is very important information for all of us to consider as we present and digest the various methods currently being attempted to reduce the fuel usage of our housing stock. Thanks for posting. We decided to save the fascia, gutter and rafter tail that forms the framing of the soffit because I have a beautiful original slate roof that I didn't want to touch. We removed the soffit trim so that the spray foam on the outside walls went up to the underside of the roof sheathing. 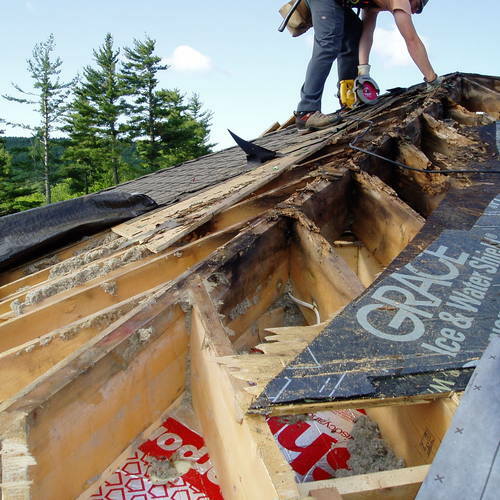 On another Deep Energy Retrofit I am working on right now (I am a project manager for Byggmeister in Newton MA) we removed the entire overhang (known as the "chainsaw retrofit") and wrapped rigid foam over the walls and roof. It is certainly more work, but eliminates the thermal bridge of the rafters and also gets rid of lots of joints between wood and foam. Our heating load has decreased from 248 MMBTUs to 90MMBTUs per year and the line is still trending downward. I still have a portion of the basement to seal (more stuff to move!) and the air sealing and insulation in the attic is not completed because the solar installers had to get up there. I've gone from averaging around $6,000 in bills per year to $2490 for the last 12 months. I have monthly heating degree data, but have not updated my spreadsheet. The 5.25 KW solar system was turned on last month so I expect the electric load for the whole house (it is a two-family with 4 tenants in the other unit) to almost hit zero. Nice work, Nice concepts, nice article. I am having trouble visualizing how the head flashing and window flange are working together. Do you have any close up photos of the window head flashing.... just before the trim casing goes on? 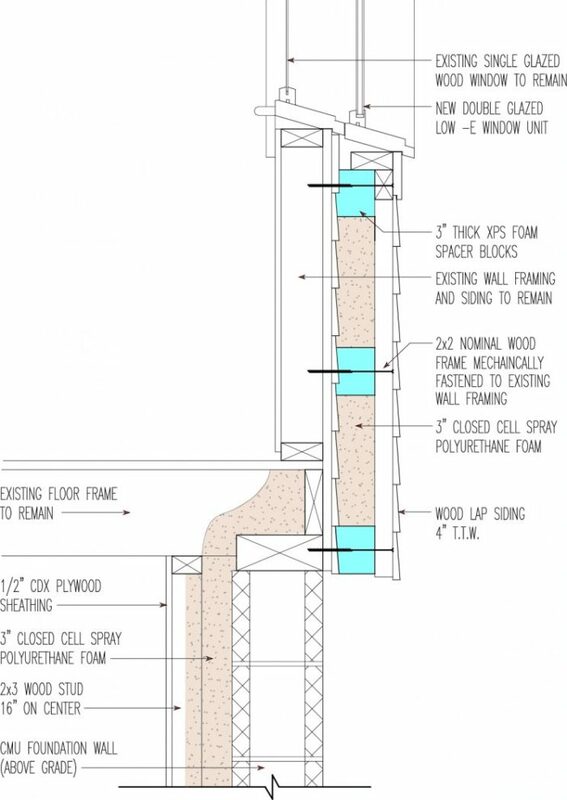 I would like someone to address the potential for using dense-pack cellulose for this type of "house coat", not just in the existing stud bays but in place of the spray foam on the exterior. It would seem like a far superior choice simply on the basis of global warming potential (by three orders of magnitude according to the above data). What performance issues preclude cellulose from being used if steps are taken to stop water penetration? Is This The Best Way To Reduce Energy Use? I believe that all the experiments that we are making now produce useful information for future work. But are the new walls justified in terms of reduction in manufacturing, transportation, and energy use of the structure. 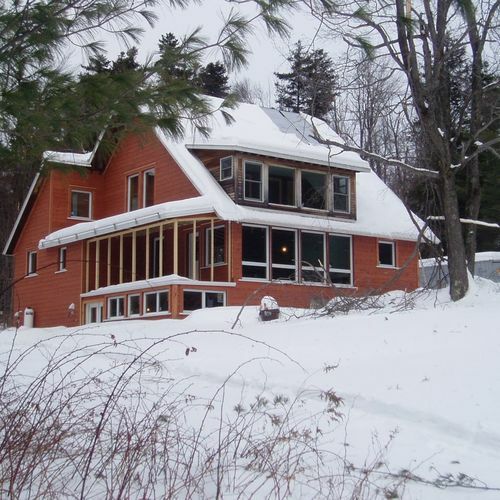 The owner shows an heating bill reduction of $3500 in the first year which is great. But what portion is the walls? The heating system was upgraded, attic insulation was upgraded to R=60. What looks to be leaky single pane, double hung windows were upgraded. All of which would have significantly contributed to the savings. There is no mention of before and after blower door tests. Was there additional air sealing done to eliminate interior chimney effects, etc.? I presume that there was and this too would contribute to the savings. So what portion of the savings is directly attributable to the "house coat" that cost $150,000.00? Will the installed components continue to perform well over the next 43 years (150,000 / 3500)? Reducing the carbon footprint of our installed housing is important for a number of reasons. However, given the total carbon cost of the new work and the continuing fuel usage, I'm not convinced that this is an advisable way to go. We had another project in the design stage where we are doing just that. We actually have an 18" furred wall filled with cellulose, complimented by an 18" furred roof also packed with cellulose. In using cellulose the stakes are raised due to water management. response to "Best way to reduce energy use"
While I could sit and argue your very valid points I choose to talk in more general terms. We don't live in caves anymore andwe don't build homes without insulation anymore (for the most part). We started somewhere and journied to present day and in doing so have created some problems we are becoming forced to solve. While we could sit back at deliberate the pros and cons of such a project, such action would simply leave the project an academic discussion. I am connected in a web of colleagues where discussion is perpetual. It's good, that these things get thought about, and thought about, "but to do good, you must actually do something" (a very impoortant quote for our time). So, while I and Cador would probably not repeat our steps if we had the opportunity to go again, at the very least we showed that there are paths we need to discover, learn, and implement our cumulative wisdom. Although you and others believe this may not solve the problems and be an advisable solution, it at the very least got us talking, and looking at even better approaches. As I said at the beginning of my post, I believe that all of these experiments are useful. If we don't do them how will we know. It's fortunate that the owner had the money and the desire to go ahead with this project. And from what I can see in the pictures, it was well executed. It does get us talking and we need solutions. I was doing energy retrofits back in 1980 and we haven't progressed all that far in 30 years. The old housing stock presents great challenges and I'm still looking for cost effective solutions for my remodeling clients. I appreciate your mutual concern. I was very fortunate to have the opportunity to work with Cador. We work in interesting times, where need to not only provide real world solutions to our industry, but more importantly, to have the ability to translate our clients problems into effective solutions and educate them into seeing the light. 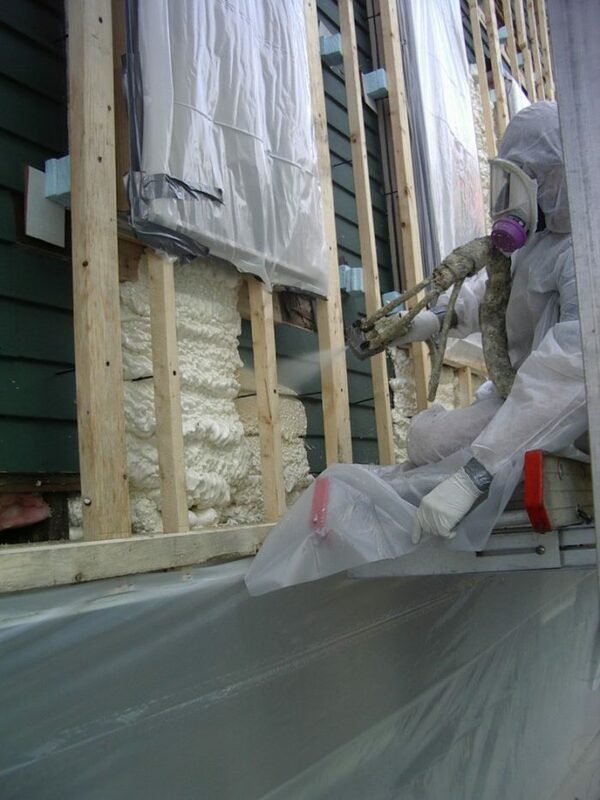 Please note that cellulose insulation is not a 1:1 substitute for spray foam. While cellulose insulation is less air permeable than say fiberglass, it is not airtight enough on its own to qualify as the air barrier. We can make cellulose work in any sort of "new house coat" retrofit project, but the air sealing details need to change, mainly with six-sided containment. And I will follow up with Cador to see what sort of before and after blower door numbers we can get. If there is no internal vapor barrier (I couldn't find any mention of internal renovations) how will the internal moisture that gets into the walls be handled. It appears to me that the old siding that is encapsulated by foam will stay wet when internal moisture (summer time humidity) gets through the wall. I am thinking that rigid foam that is furred off the old sheathing is a preferable method. Yes, removing the old siding will be labor intensive but it will save some wall thickness and allow for easy furring. Also, I was told by an experienced builder that removing the siding and adding 1" of rigid foam under new siding is the most cost-effective method of adding more insulation. Adding more insulation and, therefore, adding furring (or framing) for the siding isn't as good a ROI. If any moisture diffuses through the wall assembly from the interior during the winter, it will never encounter any surface that is cold enough to permit condensation. That's because the closed-cell foam keeps the old siding and sheathing warm. No condensation, no liquid water -- no problem. 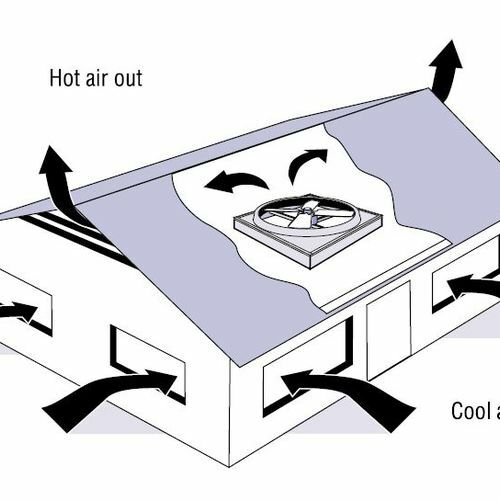 During the summer, the vapor drive is usually from the exterior toward the interior, not vice-versa. Since interior air is usually cooler and dryer than exterior air during the summer, there is no reason to believe that moisture will diffuse from the interior toward the exterior. Even if it did, where is it going to condense? During the summer, there is no diffusion from the exterior to any cold surfaces -- because the closed-cell foam stops inward solar vapor drive. A very nice looking project - and wonderful discussion! The stacked windows is an interesting approach - are the new outer windows just narrow enough to tilt in for cleaning or repair if inner sash are removed? The comment about the siding and sills rotting is mostly correct. 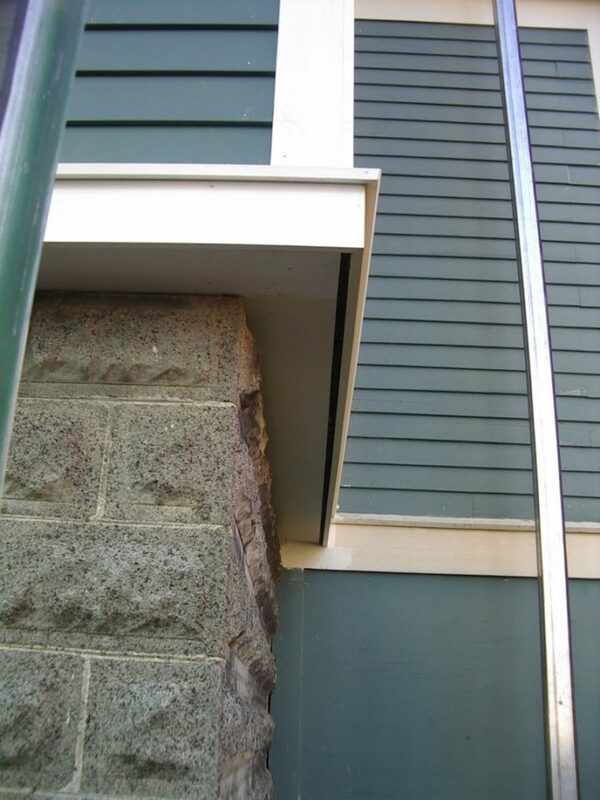 Moisture will come from any tiny leaks in the siding or around openings. The bigger problem is from vapor from the inside of the house . If the vapor barrier is not perfect (100 year old home, what do you think) moisture will enter the wall cavity from all the usual places, outlets, wall partitions window trim, etc. This moisture goes to the foam and stops (think double vb) where it collects and eventually starts rotting any wood its in contact with. The resulting damage can literally be catastrophic. I'm rebuilding a municipal fire station that is basically being held together by the sprayed foam. Floor beam, joists, wall studs and trusses are rotted to the point of being able to pull them out in handfuls. Rigid foam with some gaps to allow moisture transfer is a much better solution. We did a similar project on our leaky 2800 sq ft house. The project was completed 3 years ago. We added 12" home made "trusses" vertically to the outside of the house after installing a vapor barrier to the outside of the old sheeting, moved the windows out, raised the roof with I joists 10 inches. We basically built a new roof over the old one. We filled the wall cavity with cellulose and the attic with 20 inches on top of the 6 inches of fiber glass. We also closed all the bypasses we could find. We also added 4 inches of closed cell insulation to the outside of the foundation down to the footer. We heat with wood and use about 2 cords per winter. I build a fire once every evening. Before we couldn't keep up and used about 800 gallons of oil. 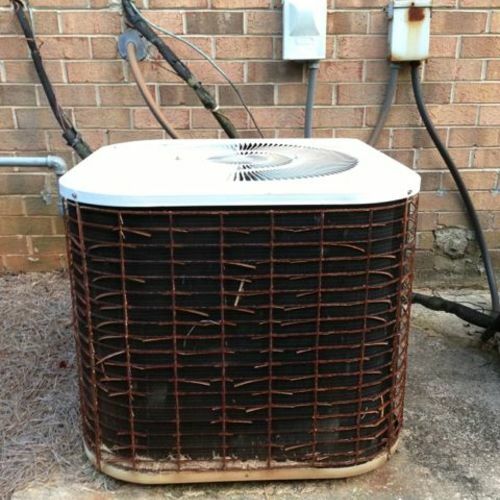 We find no need to improve the old heating system because it is used so little. My belief is that the moisture barrier inside of the new insulation will prevent any condensation within the old walls because they are always warm. I have always been a proponent of trying new methods and technologies in our search for better efficiencies in construction. However, I am disturbed to see the trend to wholesale use of spray foam insulation as a quick and easy fix to everything. Besides the "carbon footprint", the use of this foam renders useless any possible future recycling of the material it is adhered to. I believe this long term view is an equally important consideration to building performance. The detail showing the spray foam at the underside of the roof sheathing shows no soffit venting of the attic space. Perhaps your code requirements are different but it would not fly here in Canada. It's great to save money on energy. That is the ONLY reason to do all this. Global warming is the equivalent of believing in the tooth fairy. Every building assembly needs a design and then construction that allows drying in at least one direction. On this project, there is no low vapor permeable material from the inside to the outside until you hit the spray foam. The assembly is designed to dry to the interior, should it get wet (the space between the cladding and the outside face of the spray foam takes care of free drainage and then drying potential from the spray foam on outward). So, will vapor get into this assembly during the winter? Some will, but it will never get cold enough to condense. Another big variable is the interior relative humidity during the winter. I have seen assemblies like this fail when interior relative humidities are running above 50% in cold to very cold climates, but this homeowner (Cador) knows this assembly is drying to the interior and will never hit or maintain a wintertime relative humidity above 35%. 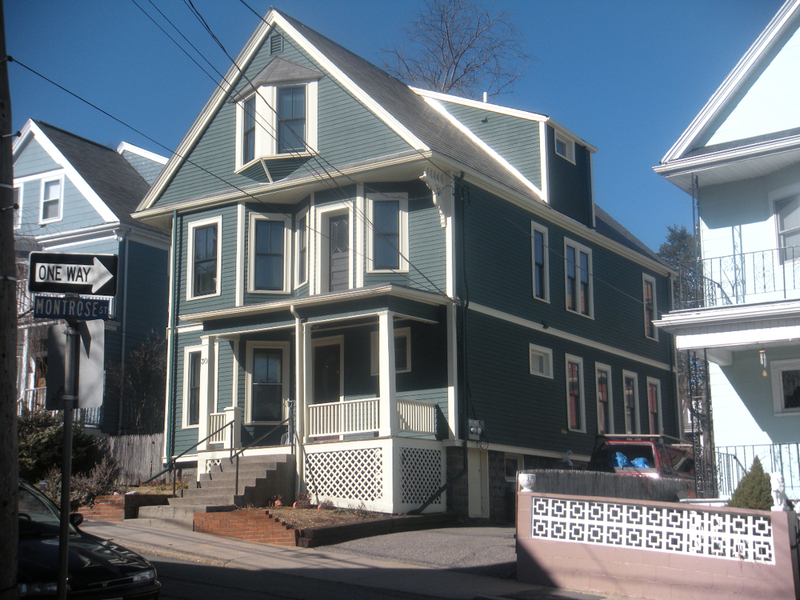 Note that the 3rd story above grade in this home is conditioned space; the roof line is an unvented assembly, at least up until the ceiling of the 3rd floor (there are gable end vents as shown in the featured photo of the home; they could mean that a small truncated unconditioned attic is gable to gable vented. Unvented roof assemblies are just like unvented wall assemblies and will perform just fine so long as they are air sealed well. Global warming is a fact, not a theory. We may argue about just how fast and what portion of this is from our activities and therefore our responsibility, but to me the consequences of being wrong on this one are just too scary. Something is warming a bit....Spring again came at least 3 weeks earlier than normal. Call it whatever...but this last week was in the 90s here. That just is not the norm -- not even the norm for a warmer-than-normal norm. Some benefits to "climate change".... fewer heating degree days to deal with and more time to go swimming in nice warm water, when usually the lake is a real cold one till mid summer. Whatever is really happening or not with weather.... I personally just love the idea of not buying energy someday.... just creating all that I desire via solar, wood, wind, bio and whatever else neat comes along. At least half of us should aim to get off the grid and be able to live independent of that tentacle. Foam and wood and tiny gaps... oh my.... definitely can be a rot horror picture show. The problem with closed-cell foam is it's closed-cell. Somewhere in a home there will be water getting into wood and rotting it with the help of closed cells. So maybe some homes can be built perfectly so as not to have issues... but what will be the average of, say, a hundred homes built.... 10 rot somewhere somehow? 100 homes should be easily built to all last for 100s of years. This idea that our homes will be torn down in 30 years is silly to me. And I do agree with those that mention the trouble involved with remodeling a home with spray foam. Also would like to mention.... R-value. The stated R-values seem to be for the insulation only, not the whole assembly R-value, which is always much lower. Stating the highest R is marketing hype. I much prefer to see honest attempts to state or understate R values... like what you all think the R-values were of the assemblies at the lowest design temp. delta T.
Apologies for my messy posts.... have to make a note to myself that I must proofread and edit a bit outside of this site, then cut and paste so as not to get stuck with such slop. R-values are defined. Laboratories that test for R-value are required to follow ASTM procedures. There is no protocol for making up your own definitions of R-value. The purpose of these rules is to provide consistent tests that allow us to compare different materials and assemblies. The temperatures at which R-value tests are conducted are defined by ASTM. These tests are not conducted at the "lowest design temperature delta-T." If you invent a new test at different temperatures, you're not measuring R-value; you're measuring Bill-value. It may be interesting, but you can't compare your Bill-value number with anyone else's R-value. 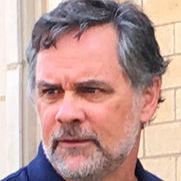 Joe Lstiburek is developing new tests that I have nicknamed the Joe-value test. Maybe in 20 years we'll all be comparing different assemblies' Joe-values. In the meantime, I'll stick with R-value. At least R-value allows me to compare different materials and assemblies with consistency. I think I know what Bill R. is talking about. Many times when I read articles.. the stated R-value "seems" to be derived from the cavity insulation only....much the same way that the building code seems to recognize R-value. Hard to tell in this case because the thickness of the foam probably varies quit a bit. On this project the exterior foam is almost all "cavity". I am guessing that this project is not overstating the R-value. Foaming on the paint, not siding. I really appreciate this project, and especially the willingness of the clients to do something innovative. 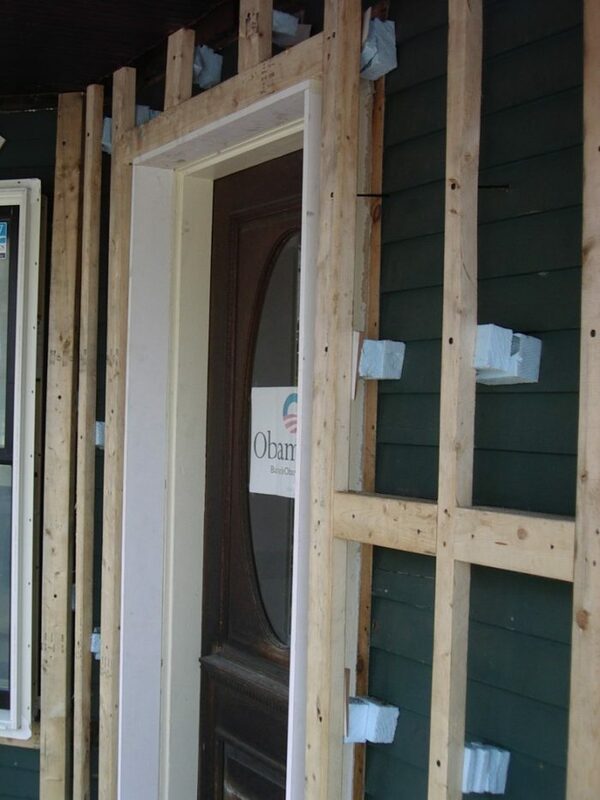 I am curious about the foaming of the existing siding. Although I think it's a very creative solution, was there any discussion about how the closed cell foam would adhere on the existing exterior paint? Not having any experience with this technique, would there be any risk of the foam chipping the paint off while it cures? I'd assume that there's 100 years worth of lead flavored paint on the siding would probably help with the adhesion, but I'm still curious about this, and about the risk of air gaps being formed in areas where the might occurr. 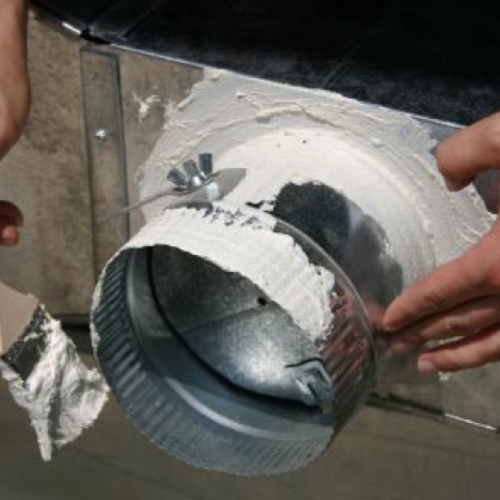 I also know it's a little off-discussion, but since the house is tightening up, what fresh air ventilation methods are being employed in the house? 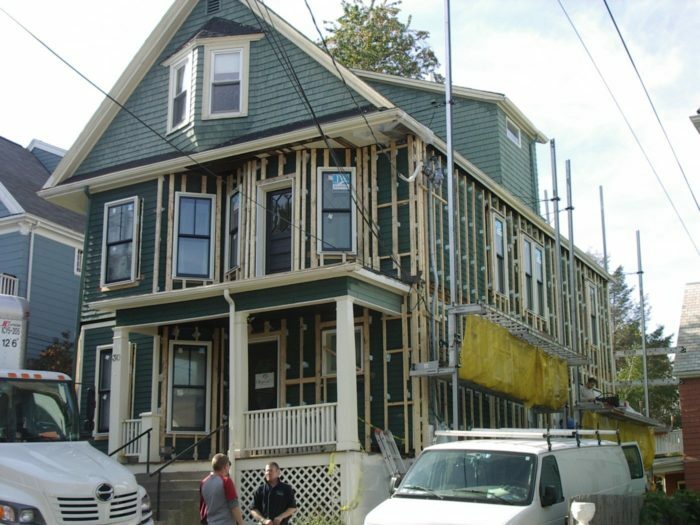 Just wanted to let you know that the latest feature article in Environmental Building News is "Avoiding the Global Warming Impact of Insulation" (http://www.buildinggreen.com/auth/article.cfm/2010/6/1/Avoiding-the-Global-Warming-Impact-of-Insulation/?). I am afraid that you do need an EBN subscription to get a copy (on-line or otherwise) for this, but it builds on the information in this GBA case study on this topic. if there was a serious enough walter infiltration problem that would cause significant rot to the wood, would using open cell foam really make that much more difference? Mold and rot are all about wetting and drying; wood can get soaking wet and then dry without decay. It is staying wet that is the problem. The vapor permeability of open spray foam is significantly higher than closed cell foam. It therefor supports drying much more than closed does. Whether or not that higher vapor permeability makes enough difference in drying potential depends on a wide range of other conditions. Great comments. I love these posts as learning from other's mistakes and successes is part of the learning experience. As for insulation R-values they are just one component in a wall or ceiling assembly. I'd be interested in the measured effective wall and attic R-values in the cold of winter and the warmth of summer wind/rain/snow. You know testing under actual operating conditions. Finally FYI, sun spot activity will be changing and for the next 11 years expect global cooling (ice age anyone?). Let's see someone fix that!